The first ten days of Zhulhijjah are among the most magnificent days in the Islamic calendar. 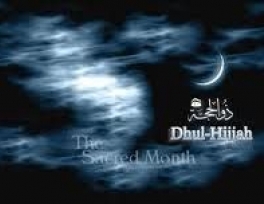 The first ten days of Zhulhijjah are among the most magnificent days in the Islamic calendar. The Holy Prophet (peace and blessings of Allah be upon him), has said, "One fast during these days is equal to the fasting of one complete year, and the worship of one night during this period is equal to the worship in the "Lailatul-Qadr" (Tirmidhi). Every Muslim should avail of this wonderful opportunity by performing during this period as much Iba'dah (acts of worship) to Allah as he or she can. The 9th day of Zhulhijjah is called 'Youmul - Arafah' (The Day of 'Arafah). This is the date when the Hujjaj (Haji pilgrims, plural of Haajj) assemble on the plain of 'Arafat, six miles away from Makkah al-Mukarramah, where they perform the most essential part of the prescribed duties of hajj, namely, the 'Wuqoof of'Arafat (the stay in 'Arafat). For those not performing hajj, it is mustahabb (desirable) to fast on this day according to their own calendar. It sometimes occurs that 9th Zhulhijjah falls on different days in different countries according to the sighting of the moon. In such cases, Muslims of each country should observe 'Youmul'Arafah according to the lunar dates of their own country. Beginning from the Fajr of the 9th Zhulhijjah up to the 'Asr prayer of the 13th, it is obligatory on each Muslim to recite the Takbir of Tashriq after every fard prayer in the following words. Allahu Akbar, Allahu Akbar, La Ilaha Illallahu, Wallahu Akbar, Allahu Akbar wa lillahilhamd. (There is no god but Allah and Allah is the greatest, Allah is the greatest and to Allah belongs all praise.) According to authentic Islamic sources, it is obligatory on each Muslim, to recite this Takbir after every fard salah. For women also, it is commendable though not obligatory. Whether you are performing salah with Jama'ah (collectively) or on your own (individually) makes no difference. You must recite the Takbir. However, male Muslims should recite it in a loud voice, while females should recite it in a low voice. 1. To wake up early in the morning. 2. To clean one's teeth with a miswak or brush 3. To take a bath. 4. To put on one's best available clothes. 5. To use perfume. 6. Not to eat before the Eid prayer. 7. To recite the Takbir of Tashriq in a loud voice while going to the Eid prayer. In the salah of Eid, Khutbah is a sunnah and is delivered after the salah, unlike the salah of Jumu'ah where it is fard and is delivered before the salah. However, listening to the khutbah of Eid salah is wajib or necessary and must be listened to in perfect peace and silence. The Urdu and Persian word Qurbani (Sacrificial slaughter) is derived from the Arabic word Qurban. Lexically, it means an act performed to seek Allah's pleasure. Originally, the word Qurban included all acts of charity because the purpose of charity is nothing but to seek Allah's pleasure. But, in precise religious terminology, the word was later confined to the sacrifice of an animal slaughtered for the sake of Allah. The sacrifice of an animal has always been treated as a recognized form of worship in all religious orders originating from a divine book. Even in pagan societies, the sacrifice of an animal is recognized as a form of worship, but it is done in the name of some idols and not in the name of Allah, a practice totally rejected by Islam. In the Shari'ah of our beloved Prophet (pbuh), the sacrifice of an animal has been recognized as a form of worship only during three days of Zhulhijjah, namely, the 10th, 11th and 12th of the month. This is to commemorate the unparalleled sacrifice offered by the Prophet Ibrahim (peace be upon him), when he, in pursuance to a command of Allah conveyed to him in a dream, prepared himself to slaughter his beloved son, Isma'il (peace be upon him), and actually did so but, Allah Almighty, after testing his submission, sent down a sheep and saved his son from the logical fate of slaughter. It is from that time onwards that the sacrifice of an animal became an obligatory duty to be performed by every well to do Muslim. Qurbani is a demonstration of total submission to Allah and a proof of complete obedience to Allah's will or command. When a Muslim offers a Qurbani, this is exactly what he intends to prove. Thus, the Qurbani offered by a Muslim signifies that he is a slave of Allah at his best and that he would not hesitate even for a moment, once he receives an absolute command from his Creator, to surrender before it, to obey it willingly, even if it be at the price of his life and possessions. Qurbani can only be performed during the three days of Eid, namely the 10th, 11th and 12th of Zhulhijjah. It is only in these days that slaughtering of an animal is recognized as an act of worship. No Qurbani can be performed in any other days of the year. Although Qurbani is permissible on each of the three aforesaid days, yet it is preferable to perform it on the first day i.e. the 10th of Zhulhijjah. No Qurbani is allowed before the Eid prayer is over. However, in small villages where the Eid prayer is not to be performed, Qurbani can be offered' any time after the break of dawn on the 10th of Zhulhijjah. Who is Required to Perform Qurbani? Every adult Muslim, male or female, who owns 613.35 grams of silver or its equivalent in money, personal ornaments, stock-in-trade or any other form of wealth which is surplus to his basic needs, is under an obligation to offer a Qurbani. Each adult member of a family who owns the above mentioned amount must perform his own Qurbani separately. If the husband owns the required quantity, but the wife does not, the Qurbani is obligatory on the husband only and vice-versa. If both of them have the prescribed amount of wealth, both should perform Qurbani separately. If the adult children live with their parents, Qurbani is obligatory on each one of them possessing the prescribed amount. The Qurbani offered by a husband for himself does not fulfil the obligation of his wife, nor can the Qurbani offered by a father discharge his son or daughter from their obligation. Each one of them should care for his own. However, if a husband or a father, apart from offering his own Qurbani, gives another Qurbani on behalf of his wife or his son, he can do so with their permission. Some people think that instead of offering a Qurbani they should give its amount to some poor people as charity. This attitude is totally wrong. Actually, there are different forms of worship obligatory on Muslims. Each one of them has its own importance and none of them can stand for the other. It is not permissible for a Muslim to perform salah instead of fasting in Ramadan, nor is it permissible for him to give some charity instead of observing the obligatory Salah. Similarly, Qurbani is an independent form of worship and this obligation cannot be discharged by spending money in charity. However, if somebody, out of his ignorance or negligence, could not offer Qurbani on the three prescribed days (10th, 11th and 12th Zhulhijjah) then, in that case only, he can give the price of a Qurbani as sadaqah to those entitled to receive Zakah. But during the days of Qurbani no Sadaqah can discharge the obligation. 1. Goat, either male or female, of at least one year of age. 2. Sheep, either male or female, of at least six months of age. 3. Cow, ox buffalo of at least two years of age. 4. Camel, male or female, of at least five years of age. One head of goat or sheep is enough only for one person's Qurbani. But as for all other animals like cow, buffalo or camel, one head of each is equal to seven offerings thus allowing seven persons to offer Qurbani jointly in one such animal. 1. Blind, one eyed or lame animal. 2. An animal so emaciated that it cannot walk to its slaughtering place. 3. An animal with one-third part of the ear or the nose or the tail missing. 4. An animal that has no teeth at all, or the major number of its teeth are missing. 5. An animal born without ears. But the most essential recitation when slaughtering an animal is: Bismillah, Allahu Akbar. (In the name of Allah, Allah is the greatest). If an animal is sacrificed by more than one person, like cow or camel, its meat should be distributed equally among its owners by weighing the meat strictly and not at random or by mere guess. Even if all the partners agree on its distribution without weighing, it is still not permissible according to shari'ah. Although the person offering a Qurbani can keep all its meat for his own use, yet, it is preferable to distribute one-third among the poor, another one third among his relatives and then, keep the rest for his personal consumption. All parts of the sacrificed animal can be used for personal benefit, but none can be sold, nor can be given to the butcher as a part of his wages. The most important way of worship performed in this month is "hajj", one of the five pillars of Islam. The Muslims from every part of the world assemble in Arabia to perform this unique way of worship. Hajj is a worship, which requires at least five days to be performed in its proper way. There are detailed rules for different acts of hajj for which separate books are available, and the present article does not aim at explaining all these details. 1. Hajj is obligatory on every adult Muslim who can afford to go to Makkah during the hajj season, whether on foot or by any other carriage. 2. If a person can travel to Makkah to perform hajj, but he cannot travel to Madinah, hajj is obligatory on him also. He can perform hajj without visiting Madinah. 3. A Muslim woman cannot travel for hajj unless she is accompanied by a mahram (i.e. husband or relative of a prohibited degree like son, father, brother etc.) If she does not find any mahram to accompany her, hajj is not obligatory on her until she finds one. However, she must make a will that in case she dies before performing hajj,the heirs should arrange for her hajj-e-badal out of her left over property. Why do people love to gossip?